ABSENT: Conor, Kole, Matt K.
Meal: Potluck of Goodies! Roast Beast (Beef Round Tip), Salad, Corn Bread, Jello Salad, Sweet Potato with Marshmellow Topping, Baklava, Apple Pie. Kier snaps out of his zombie mentality but Soren, Saltharion and Edge both go into one. Kenshin, Ella, Hawkeye, Mysti and Kier all go back to the outpost to relinquish Kenshin’s command to the previous commander. We take the horses back to the city. On the way we hear not-quite-right wolf howling sounds. We begin circling the wagons… We spot large canine forms approaching. The one in the lead stops the rest and then howls. The horses become spooked. 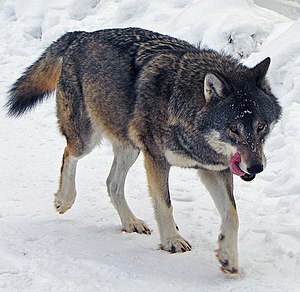 The wolves are 9′ long and over 800 lbs. We make a circle with the wagons, and they attack from two sides. Kenshin hits one, another bites a driver, kier hits that one but is knocked down, Hawkeye hits Kenshin’s, and Ella goes bear for hitting a third. Bodyslams and bounces off. The wolves were compelled by someone to attack us, but they do not know who. We all know the face of the person who sent the wolves to attack us. Sir Soren not-appearing-in-this-session has seen who this is. Kier wants to kill the wolves and does. Hawkeye is sad because he wanted a 9 foot bloodthirsty pet. We walk to the edge of the field of non-teleportation, and then teleport to Hillsfar to find Simon. The people that are normally with Simon are in the establishment, but not Simon. We ask for Simon. We get intel on the safehouse on Miller St. (destination!) and we go there. We mention the prophecy and they have no idea what it means. There is a man (who sent the wolves after us), tall with blonde hair, moving with disdain a talisman with a sunburst, and there’s someone off camera saying how he sent their leader to the land of dawn. Ella tries talking to spirits. Simon was walking, and a pit opened up underneath him and he disappeared. A tall man with blonde hair walked and fell in the pit behind him. We investigate the pit area, and we find nothing special. We go to see Merrick (even though we don’t know his name). Merrick says Simon is in a dimension which is hard to get to because of walking backwards and a feather and yada yada yada. Simon’s portal opened up exactly when we drew blood on one of the wolves. We ask to open the portal to wherever. We get the list of things to do and we get done and are told to begin the ritual at pre-dawn. We perform the ritual, a pit opens. we ask questions like “how do we get back” and figure out that we have to have someone on this side to open the portal again in days time. We jump in, and a few of us (who failed will saves) don’t want to leave. Eventually we find hippie Simon. And his hippie entorage. Hawkeye persuades Simon and Kenshin to want to leave but finds it harder to convince the others but we do. We rush mightily into the portal. We get back, and talk to Simon.